I recently purchased a 72 Skylark Custom project car that was well maintained and garaged most of its life. Here are some pics to show the effects of the rubber trunk mat and the rubber floor pan sound deadener mats on metal surfaces. This car has only 98k miles original and two owners! This is the factory houndstooth trunk mat. This was/is a bad idea from day #1. The problem with this item is it does not allow moisture to escape from under the mat. High humidity areas will have water collect under the mat due to condensation at night. Save this item for shows only. I like to use black cut pile carpeting from Home Depot, 6 foot width, $3.49 per linear foot, to carpet the trunk. You can also find black cut pile spare tire covers in most salvage yards in GM luxury cars. It makes a nice finishing touch for the trunk. 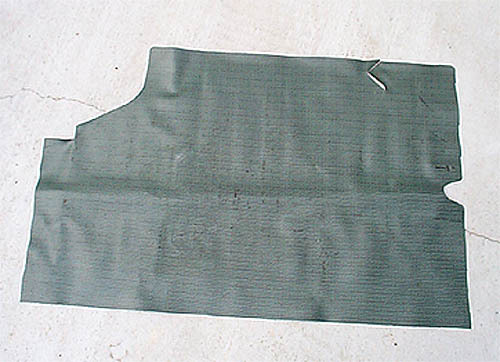 When it is time for show, simply remove the carpet and install the factory original trunk mat. This is the result of leaving the factory rubber trunk mat in place. This is a Florida car and you can see the results of high humidity. 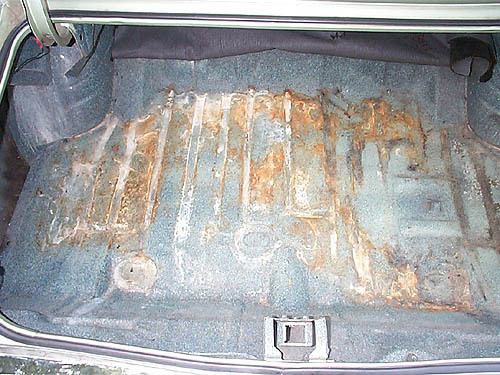 This trunk was recently refinished but the trapped moisture started the rust process. Luckily, this was caught early. To correct this problem, use a steel brush or wire wheel on a drill motor to remove all loose rust. Next, brush on "Ospho" (Phosorphic Acid) or similar rust imhibitor. Let the solution cure (turns black) then remove any residue and respray trunk with correct trunk splatter spray paint. This one is aqua and black which seems to be hard to find. Most "A-body" parts houses such as Parts Place Inc, OPG and Year One carry the paint. If you want grey and black, most automotive stores such as NAPA and Autozone carry that in stock. This is the driver's side floor pan. 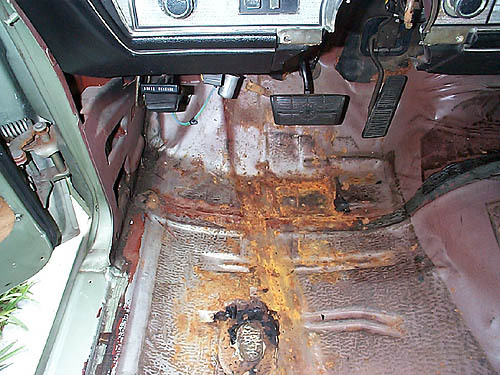 Notice rust starting under rubber sound deadener area. 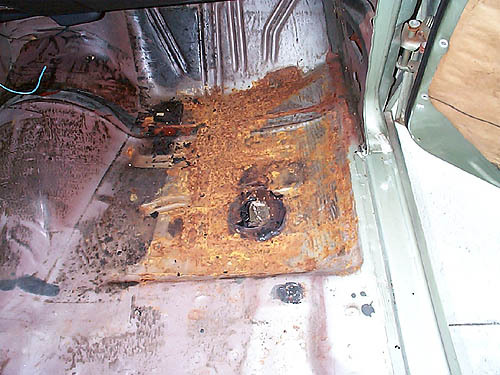 No rust anywhere else except foot well areas and under rear seat. 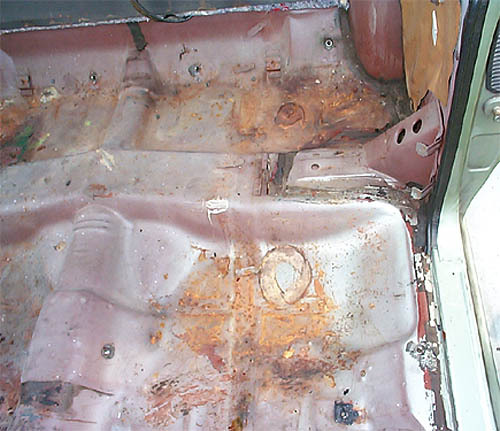 Notice sound deadener material impression on floor pan surface. Driver's side rear foot well and under rear seat bottom cushion. Notice rust starting in these areas too. Passenger side front foot well area. This area had the most rust! Passenger side rear foot well had minor rust. 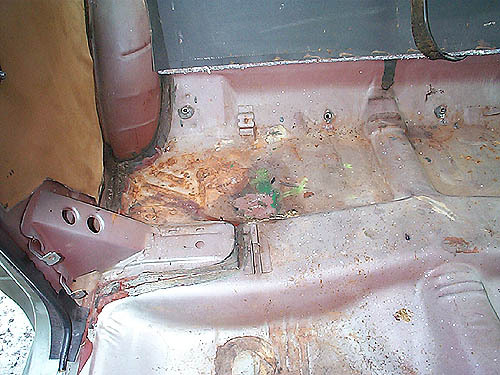 However, area under rear seat had quite a bit of rust.